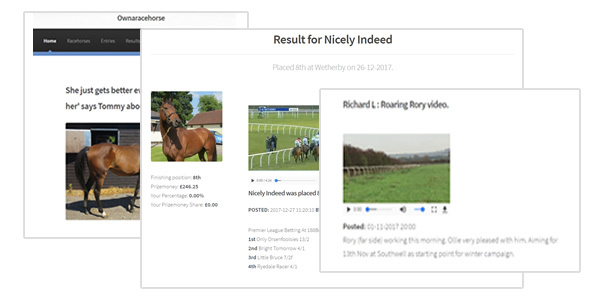 Our 'Racehorse Manager' is sophisticated software that allows us to keep our shareholders bang up to date with everything concerning their racehorses. Whether you are at home or on the move, our easy-to-use system allows you to keep abreast of every entry, declaration, run, and of course all the latest stable news. Want to find out how our horses are doing and be informed when we add new racehorses? View the sort of emails we send. We will only ever send you email messages and will never provide your address to other companies. We do not under any circumstance, sell or disclose to any third party any shareholder or visitor information gathered by any script or device within this website or our Racehorse Manager website. All personal information provided to Ownaracehorse, specifically your email address and postal address is held securely. Every page on this website and any associated websites are securely encrypted. We may contact you from time to time regarding the Ownaracehorse service and associated company services, but all emails hold an opt-out link which will remove you immediately and for good from the distribution list. Shareholders are able to switch communications on and off within their account. All e-mail form submissions are logged to a file. This protects against lost e-mails. The file is purged on a regular basis. The Ownaracehorse Newsletter and the owners update communications are sent as individual emails. Therefore, your email address will be secure and read only by you and will work with any email system. We may provide links to third party web sites, which are public, and provide readable web pages. There is nothing we can do to prevent spammers from harvesting names from third party sites so please do not give you information unless you are sure of the business you are dealing with. Our hosting company operate the Ownaracehorse site on their secure server system. They have security procedures which can be viewed on request and are of a very high quality and robustness. Any other changes or alternative uses of Cookies or similar tracking devices will be reflected in this policy statement as needed. View Racehorses | Gift packs | About | Why choose us?